With Star Joker, Play'n GO takes us back to the basics. As you can probably tell from the appearance of it, it's a fruit slot inspired game. Usually, these type of slot machines are often associated with relatively low payouts, but in this case, it comes packed with plenty of potential. It's very simplistic and straight-forward in the sense that it really only involves one feature, which is the free spins game. Interestingly, and maybe a bit humorously, Play'n GO decided to introduce a walkthrough for this slot that undoubtedly is one of the most simple ones they've ever produced. Visually, it may look old school, but the engine behind it is a modern one. With purple background, Star Joker has a disco feel to it and the low-key, funk style soundtrack playing along to the action is more or less what you expect to hear in a slot like this. There's nothing extraordinary about the setup - it comes with 5 reels, 3 rows and fixed 10 paylines. Playable on all devices, players can bet between €0.10 and €100 per spin, making it suitable for all type of players. On the reels you will see classic symbols such as cherries, strawberries, plums, oranges, watermelons, bells, diamonds and lucky 7s. As can be seen in the screenshot above, the lucky 7 is the top paying standard symbol and gives you 100 times the stake for 5 of a kind. There's a Star wild included in the game as well that only appears in the free spin feature, however. Land 5 of them in the bonus and you'll win 500 times your stake. It should be noted that the symbols do not appear stacked on the reels, which means that the max win per single spin in the base game is a little over 100 times the stake. It also means that most of the potential is allocated to the bonus game. In the base game, look out for the Scatter Joker symbol, as 3 of them on reels 1, 3 and 5 will give you 10 free spins. Land another 3 during the bonus and you'll be awarded an additional 10 free spins to take your total to 20. In the free spin feature you will benefit from two things - not only does a wild symbol come into play, but the Scatter Joker symbol now also acts as a wild something that significantly increases your chance of landing a wild line and thus the 500 times the stake max win per single spin. It doesn't sound like much, but with 20 free spins there is plenty of room to land more than one of those. 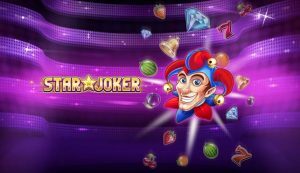 Star Joker is a basic slot that doesn't involve explosive wins, yet it should not be discarded as it does, in fact, have a max win potential of 5000 times the stake in the bonus. To get there, however, you would have to land 10 wild lines, which is of course highly unlikely to happen, yet still seems reasonably within reach should you manage to get a re-trigger. It's definitely one of the better fruit slots we've seen in a while, and there's no doubt that we're going to see plenty of casino streamers have a go. If you prefer slots with more features and backstory, it's not for you, but if you're into low variance games that still offer plenty of potential, Star Joker is a must try.